The band announced that they are rescheduling 10 shows on their 'Rock or Bust' world tour with a guest vocalist after Brian was told to "stop touring immediately or risk total hearing loss". In a statement on their website, the band said: "AC/DC are forced to reschedule the 10 upcoming dates on the U.S. leg of their 'Rock or Bust' World Tour. 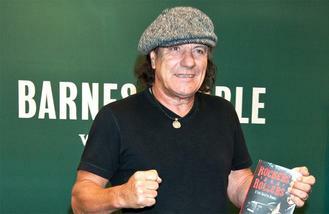 AC/DC's lead singer, Brian Johnson, has been advised by doctors to stop touring immediately or risk total hearing loss. Tuesday's (08.03.16) show in Atlanta through Madison Square Garden in New York, NY in early April will be made up later in the year, likely with a guest vocalist. More information regarding these rescheduled shows to come." AC/DC have had a number of issues in recent years with founding member Malcolm Young, unable to continue with the band due to suffering from dementia, and ex-drummer Phil Rudd given an eight-month home detention sentence for drug possession and making threats to kill last year.